When Bayern started a settled deep build-up, Atletico’s players established a structural-block with multiple pressing-orientation within. Against Bayern’s 1st phase of build-up, they opted to focus on middle-block. The resting-press saw them allowing space for the opponent’s central-defender (CD) as the part of their initial plan on deflecting the circulation to the flanks.Torres-Griezmann duo was tasked with different duties. Fernando Torres heavily-oriented to Xabi Alonso, which took effect on Atletico’s defensive shape into a 4-4-1-1 as he followed Xabi around the back-line and 6 area of Bayern’s. The question is, why Torres not Griezmann? Theoritically, Torres has better physical-presence compared to Griezmann. The Spanish got the required physical need for an aerial-duel and on ground shoulder-clash compared to the Euro ’16 top scorer. The assignment of Torres to man-to-man Xabi also enabled the French to play a free-role as he didn’t have to stuck to a stricted-duty which might nullify his explosiveness. Given his assignment, Griezmann was free to create immediate impact should Atletico managed to stop Bayern’s attack and released a quick counter. The only goal by Carrasco could make a good example. Torres engaged Xabi in an aerial duel. Xabi won it, but the ball fell to Griezmann’s feet. In seconds, he dribbled to the center and made a short pass to Carrasco which ended-up the only goal of the match. Back to (the first wave of) Atleti middle-block press. Whilst one of #9 man-marked Xabi, the other one, oriented to the ball-carrying CD, but not in a strict man-oriented style. Griezmann positioned himself to the ball carrier and the options the opponent possibly take. At times, Griezmann dropped the 10 and Torres pressed the ball-carrying CD. Griezmann stayed narrow to push the circulation to the flank. When the ball played the wide area, Griezmann and the near wide-men shifted and pressed intensely to the touchline. In this situation, Griezmann made an arch-run and positioned himself to block any possible back-passes. 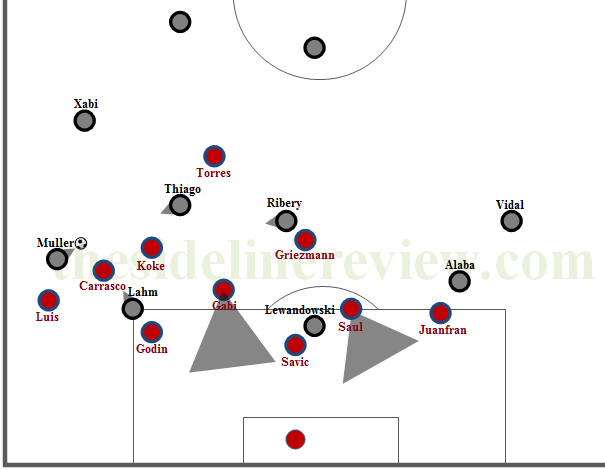 In the third-line of Atleti’s press, along with 6-duo, the wide-men tried to keep an eye on Bayern’s wing backs whilst maintained the access to their own central midfielder zone in their initial shape. Such access could be gained as Atletico’s wide-men stayed narrowly and occupied the half-spaces and stayed on the same line to the 6. At times, they stayed slightly higher and occupied the intermediate area between #6 and #10. The pressing-behavior of #9 and winger in respond to a pass to the touchline. The ball-side winger moved out intensely to press Bayern’s ball-side wing back forcing him to be trapped on the touchline or forced to make a back pass to the goalie. In the central midfield, Gabi Fernandez and Koke trying to keep compact and put an eye on Bayern’s 8 or wide-men who moved into their respective zones, from which they could apply immediate pressure to any opponent moving into. With such approach, the 6-duo could also originate a proper shape as they needed to cover any movements by Atleti’s wide-men, thus they able to maintain a more stable spatial-compactness. To avoid being trapped earlier on the wide area in their 1st pahe of build-up, Bayern #8 dropped deep and moved wide acted as the progression-access and pushed the ball-side wing back further forward into the opponent’s area. This positional-structure was able avoiding Bayern from being trapped in their build-up, particularly when Atletico didn’t follow Bayern’s 8 movement. 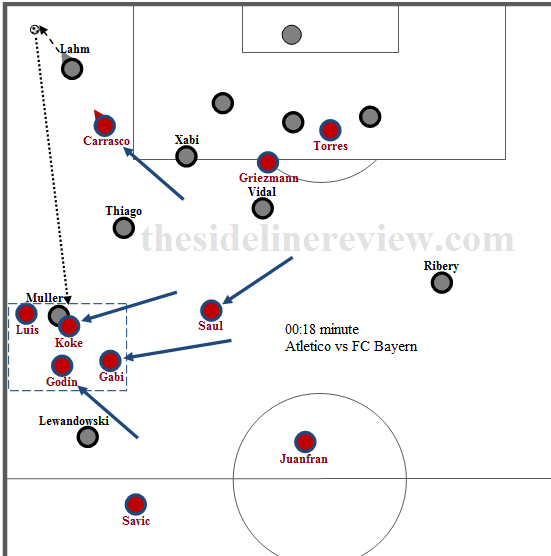 But, when Bayern progressed and got into the Atletico’s half, through the flank, the issue occurred for the guest. It was an easy task for the host to trap and force another back-pass. In the first klip, you can see a smart pressing-structure. Griezmann opted to cut the lane between Vidal and Ribery, Saul made an arch run which covered Ribery and Alaba at once, and Gabi man-orientation on Ribery had him pressed the Bayern’s winger from behind. 3v2 in favor to Atleti managed to stop the progression. The potential problem arised when Bayern switched the circulation from one flank to the opposite flank and their 8 dropped-deep to get involved in the build-up. 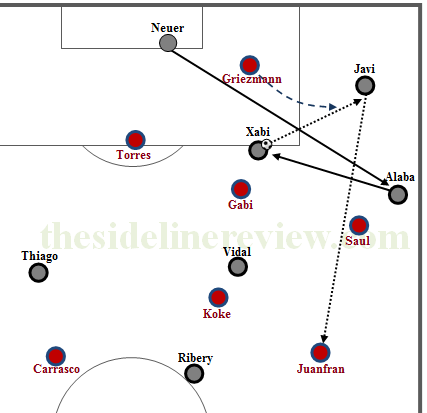 But, again, Atletico showed how good they were at overcoming such tactic. This is why ” the potential problem” just remained as it was. Simeone’s troops seemed to be ready to deal with such situation. One good example was the moment from 00:50 minute. Firstly, let’s see from the Bayern side. Having received the ball from Alaba, Neuer distributed it to Jerome Boateng on the right defensive half-space. 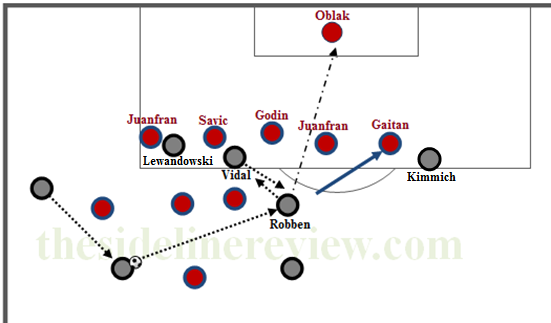 As Boateng gradually stepped up, Bayern’s near wing back adjusted and moved to the higher ground on the middle-third. At 6, Xabi oriented himself to Boateng to create diagonal option for Boateng. How Atleti reacted? 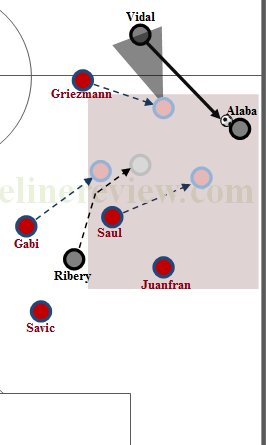 After Alaba played the ball to the goalie, Saul Niguez (who previously moved out and pressed Alaba) and Griezmann (previously pressed the ball-side central defender) shifted and covered the central area. Saul moved back to the middle-line. His positioning should have enabled him to keep the access around half-space and 6. while Griezmann took the #10 post to keep Xabi under-control. These adjustments enabled Torres to also adjust his positioning. The striker slightly-loosened up his press on Xabi and shifted gradually to the left which allowed him to block Boateng’s diagonal option and Xabi movements at once. Against such pressing structure, the remaining option for Boateng was a pass to the touchline, to Philip Lahm. But, Atleti managed to cut it off due to the positioning of Carrasco. So, where was the potential problem, as aforementioned? In such situation, Bayern’s 8 would respond it by dropping-deep to create another option for Boateng. The problem occurred if Atletico’s nearest 6 followed the opponent’s 8 as he moved out and pressed intensely. A pressing behavior that might unstabilize the spatial-compactness on central-midfielder zone. But, it never happened, because Gabi had covered the vacated space as he occupied the intermediate area in front of the back-line. Untill this point, Gabi defensive movement seemed to be not enough to keep the shape remained compact as it needed to. Why? Because, when Koke moved up to follow Bayern’s 8 it means Koke left his 6-duo alone to cover up a huge space at 6. To some extent, is sounds to be a horrible tactic. But, it was completely not. The key that enabled Gabi to keep the defensive-compactness around Atleti’s 6 was Saul, as the winger shifted to the center and provided adequate cover for Gabi. Positioning adjustment after Bayern’s switch from left to right. In any tactic, both offensively and defensively, body gesture is an important element. A right body gesture enables players to gain an ideal point of view as they need it to maintain the access to the opponents, space, teammates, and ball. Take notice on Torres and Carrasco. They kept the positioning slightly deeper to the opposite players as it gave them better point of view and access to cut any passing coming in. The identical approach taken by Koke. He followed Thiago intensely but kept himself behind which enabled him to put a press from blind spot. In the back line, the back-four stayed in the deepest area. Man-orientations were commonly seen. Atleti’s wing-backs went for Bayern’s wide-players and the CB-duo to go against Robert Lewandowski or any other players receiving in their zones. Despite opting to focus more on middle-block, it didn’t mean Simeone’s boys abandoned the chance of pressing high up the pitch. Such press be generated depending on two factors. First, the area of where the ball was played and, two, the view of the field of the opponent’s ball holder. For example, if Bayern’s defenders chased the ball on the corner (with his back to Atleti’s goal), the nearest players of the host would move up and press from the said opponent. This is important because this kind of press potentially forced the opposition’s player to hoof the ball clear or made mistake near his goalie. Atletico were compact and still able to make smart adjustment on specific zones. This could be observed when they faced a pass that fell onto the wide-area, which was the isolation-zone. 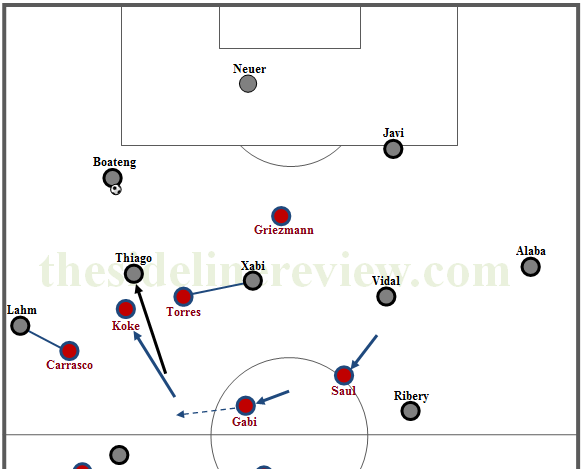 Atleti’s players formed a local-compactness formation which supported by proper intensity of the ball-oriented. The interplay between the lines was superb. One of the example was from the situation of the 1st minute. Carrasco moved out and pressed Philip Lahm who chased the loose ball on the right corner Bayern’s deep area. Lahm recovered and hoofed it clear to the right flank. To compromise the vacated space on the left, Saul, Gabi, and Koke shifted horizontally far to the left, along with a diagonal run by Diego Godin and vertical move by Filipe Luis. These ball-oriented movements gave them numerical-advantage and Atletico regained possession. Local compactness on the flank (the isolation zone). In a more passive situation against a wing-orientation build-up, Atleti’s ball-side winger pushed way up into a 3-forward-shape to block the possible advance of Bayern’s wing back. To support and maintain the access in the center, the far-side winger stayed in the midfield on the same line with the 6-duo, allowing them to provide adequate cover to the first line of press. Bayern looked to exploit the pocket defence. Ribery and Thomas Muller often caught occupying the space between-the-lines. To overcome such potential threat, Atleti made use of the onward press by the central-defender and the backward-press by the #6. The backward-move by #6 was key to nullify any vertical or diagonal pass to the center. Of course, a backward-movement from one of #6 (in a 4-4-2 basic formatuon) might reduce the cover to the central area and unstabilized the spatial-compactness. This is where we have to appreciate the work of Atleti’s #9. The staggering between 9-duo turned the host to a 4-1-4-1 shape, as one #9 moved into the midfield and acted as the additional midfielder. By getting into the middle-line, #9 undirectly helped maintaining the access to the defensive-pocket as it allowed Atleti’s #6 to drop and defend the defensive-intermediate area in triangulation to the CD-duo. As explained earlier, despite the central midfielders opted to keep the shape remained compact by applying a position-orientation approach, they still looked to apply a man-oriented press which commonly triggered by the drop-deep movement f Bayern’s #8. Atleti’s near #6 followed this move, as it might enable them to press Bayern even deeper into their own defense. As the #6 moved further up, his teammate and near-side winger would have to cover it. Again, thanks to the strong ball-orientation and narrow shape which made it easy for Atletico to cover such move and stay flexible in their pressing. The ball-orientation to the ball-side automatically created space for Bayern on the opposite half-space. To keep the structure balance, one of #9, usually Griezmann, moved wider, positioned himself between the midfield three and the first line of press, to deal with any Bayern’s wide-man threats. 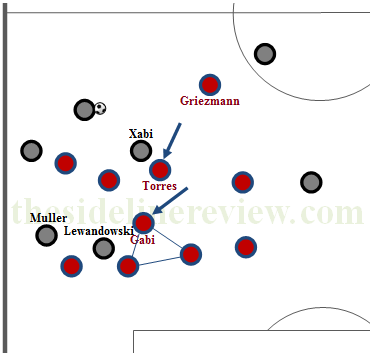 At times, Griezmann moved even deeper and acted as secondary #8 covering the far-side half-space and center as well. This, in turn, allow Los Colchoneros to constantly isolate the center and weakened the opponent’s connection between the wide area and the center. Sometimes, due to the heavy man-oriented press applied by various players, the host needed to adjust their defensive shape. An impressive disciplined display was, once again, clearly seen. Take a look at the below image. Positional disciplined. Diego Godin, Stefan Savic, Luis, and Juanfran displayed man-orientation in their press and opened up some horizontal spaces. To cover those spaces, Gabi and Saul stayed deep, positioned between the gap, and blocked the access. In this scene, Muller passed the ball to Thiago. Take a look at Thiago view of field and Torres positioning.. It was a trap prepared by the Torres on Thiago. Fortunately for Bayern, Thiago individual quality allowed him playing through the trap and switched the play to the left side, to Vidal. This scene ended-up with Atletico gained a goal-kick. Overall, in their deep-block, Atletico defended between 4-4-2-0, 4-1-4-1, or 4-4-1-1. In the 4-4-2-0 block, for the example, the #9-duo was the first barrier to stop/hold Bayern from playing through the center. An example can be obserevd within Bayern’s horizontal circulation (from one flank to the other one). When the ball reached the center, Atleti’s #9-duo would apply half-onward-press (fake-press) to keep the ball (away from the central area and) rolled to the flank corridor. Again, we can see how important the touchline is for Diego Simeone’s boys. When the ball approached the near halfspace, Atleti’s ball-side winger moved diagonally onward from the wide to the more central area, as he tried to funnel the opponent’s player to the flank. 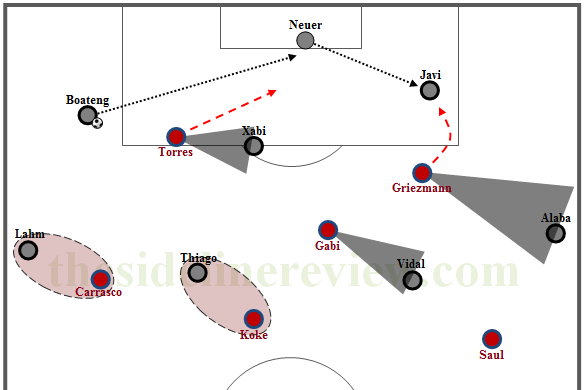 Right after the ball reached the touchline, Atleti’s near wing back moved out and pressed intensely with the support from the near CM and advanced-winger. Deep-block and 4-4-2-0. 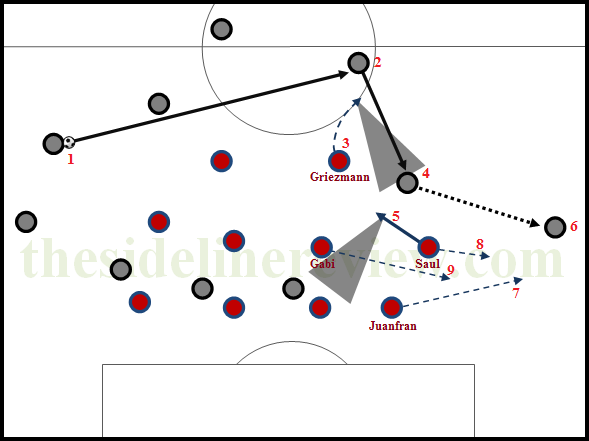 Griezmann arch run (3) defelected the circulation wide, Saul diagonal move from the wider-area to the center (5) funneling Bayern player to play it wide (4 to 6). Intense pressing-moves by Juanfran (7), Saul (8), and Gabi (9) as they had to press the touchline. Atletico narrow-shape had its advantage both offensively and defensively. One of the outstanding performer who utilized such advantage was Filipe Luis. Started from the left back, Luis often seen occupying the central area. His diagonal movement to the center often created numerical-superiority which for sure could help resulting immediate recovery when Los Colchoneros were being forced into a defensive-transition phase. Compact block and overload resulted many attacking transitions for the host. With good off the ball movements and staggering, Atletico’s players established themselves in an ideal structure which made it hard for Bayern to counterpress. In short, Atletico have the required pressure-resistance in order to by pass any intense press by the opponent. Good staggering which established by the ideal positioning gives a team in adequate spacing, allowing them to occupy more strategical spaces in turn. Los Colchoneros  pressure resistance within their attacking transition. In an attacking transition (from deep block), Torres, Griezmann, and Carrasco were the prime weapons for quick counter strategy. As the front-liners, Torres and Griezmann, positioned themselves for any deep passing play, looked for immediate progression after receiving or made quick-combinations with any vertical movements from the lower-liners, particularly from the loghtnig-speed Carrasco. Atletico attacking structure (narrow-shape and good spacing) established an ideal access to the opponent, ball, and space. It’s all supported by the fact Atleti’s players capability at covering grounds is enermous. It, in turn, helped them to apply many stable counterpresses. The stability of counterpress was due to the ideal spacing in a narrow shape by the players from various zones which allowed them to cover less-grounds when applying the press to the opponent’s ball-carrier to regain possession. Torres press combined with the man-marking on Lahm and Thiago forced Boateng to pass it back to Neuer. The goalkeeper played it to the left to Javi. Griezmann came close to Javi by arching his run counter clockwise, funneling the CD to pass it to Neuer. Why it was necessary for the French to funnel the ball to the goalkeeper? It was because Torres had anticipated how Bayern would possibly react. The Griezmann-partner shifted from left half-space to the center. So, when Griezmann press managed to make Javi played the ball to Neuer, Torres had already been close to Neuer. And, along with Griezmann, the two could put a press to the goalie from two various directions (Torres from the left and Griezmann from the right). A short passing-play between Neuer and Javi had created passing angle for Neuer to play through the press as he passed the ball to Alaba on the left touchline area. Neuer, with his ball-playing ability, found Alaba on the left touchline. But a press by Saul managed to push Alaba to play it back to Xabi who played it deeper to Javi. An intense press by Griezmann forced Javi to play long forward which got recovered by Juanfran. Atleti’s high-block killed Bayern build-up. Later in the second-half, Ancelotti made 3 substitutions. Arjen Robben replaced Muller on the right wing, Mats Hummels came in for Boateng, and Joshua Kimmich for Thiago. With all of these subs, Ancelotti it was a strong indication that Don Carlo tried to raise the intensity and verticality of Bayern’s attack. Hummels even made positive early signal after coming in. The ball player moved forward approaching Atleti’s defensive third and put them in an unprepared situation. In this case, Saul and Gabi seemed to be reluctant to leave their assigned-opposition. Everything became even worse as Torres was too passive and allowed Hummels to go through Atletico’s right half-space which also caused a dilemma for the six’es. Either moving up to block Hummels and opened up the #10 for Lewy and Ribery or let the CD to create the play on his own. Good for Atletico, because Hummels decided to make a long shot which blocked by Koke. For Atletico Madrid side, Simeone replaced Carrasco and Torres with two explosive players, Kevin Gameiro and Nicolas Gaitan. The intention was clear. Simeone tried to maintain the speed as it was needed for their quick counterattack strategy. Bayern improved their attacking structure compared to the first-half performance. They displayed better spacing, connection, and movements. This improvement saw more triangles, diamond, or access succesfully-created, as it’s important for the central penetration. On the other hand, the host were also able to maintain the intensity for full 90 minutes and even played it better than they did in the first 45 minutes. Weakness? Yes, there was. It was more to an individual mistake. This (minor) mistake often found, particularly, on the wide area. It was Carrasco who several times caught standing slightly too wide which allowed Bayern to penetrate through the half-space. Such mistake slightly reduced the homogenous within the structural-block. The moment of 13th minute was one of the perfect example. Carrasco thought Boateng would pass the ball to Atletico’s left flank. His gesture showed it. But Boateng opted for Thiago who occupied the near half-space. Having received the pass, Thiago played it to the left but Atletico’s defenders managed to clear it away. Thiago recovered it before realeasing a brilliant chipped-pass, leading to a shot by Thomas Mulller which parried away by Jan Oblak. At times, the man-orientation within Atletico’s defensive system also caused problem in their deep-block. This was getting clearer after Robben introduction. The Dutch covered the attacking ground well. He made more positive impact than Muller did before. Robben moved inward, overloaded, and made a quick combination in the zone 5. The Ducth movement was well-balanced by Joshua Kimmich. When the winger tucked in, the Germany youngster moved wide. Gaitan, Atleti’s left winger, anticipated it well, but sometimes his over-zealous press on Kimmich and the intensity of Bayern circulation managed to weaken the compactness. This created more space in the center to exploit. Weakness within Atletico’s deep-block. Gaitan, heavily-focus on Kimmich, had been the part of how Robben gained some space in the zone 5. Atletico clearly deserved this win. They displayed a resillient defence and forced the opponent to play as they needed to. Atletico Madrid showed, impressively, how a match can be tactically controlled without a lot of possession. They kept Bayern from playing through the half-space and center and isolated them on the flank. In their attacking transition, the spacing established good staggering and collective pressure-resistance which helped them bypassing Bayern’s counterpress. 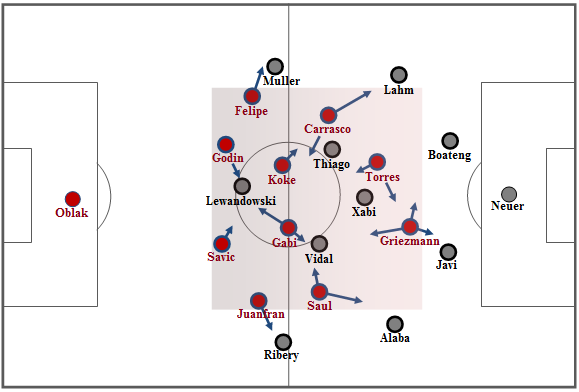 On the more established-possession phase, Atleti were more consitent to Bayern, as the attacking structure not only give them better connection between lines and zones, but it also positively-impacted to the defensive transition, should the ball lost to the oppositions. There is still a long season. And, it remains to see if this type of defence can be carried over to the clubs that are less focused on possession than FC Bayern, Barcelona, Dortmund, or Man. City. This entry was posted in tactic and tagged Atletico Madrid, Compactness, Defensive system, Diego Simeone, FC Bayern, Pressing, UEFA Champions League. Bookmark the permalink.